Publisher’s summary: A gorgeous, witchy, romantic fantasy by a debut author! Perfect for fans of Kristin Cashore and the Beautiful Creatures series! My take: Oh! Crap! Did that ending really just happen? What? Seriously? Now I’m extremely upset that I loaned out my copy of Star Cursed because I really want to read it…like now! I was a little leery about starting Born Wicked because I’ve heard some pretty mixed opinions about this book. But I’m now extremely happy that I read it! And I’m now thinking that the people who had negative thoughts about this book probably didn’t end up reading the whole book because I loved it! And the ending was absolutely phenomenal! Oh, that crazy, hectic ending for sure has set the tone for the remainder of this series, and I’m thrilled. I’ll have to admit it’s a pretty big cliffhanger, but it still ended perfectly brilliantly. The characters were all very well developed. 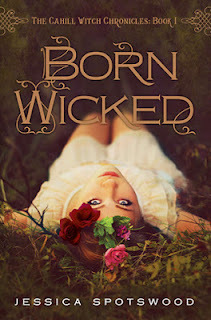 While reading Born Wicked, I came to feel really bad for Cate (protagonist) because she was left with the burden of protecting a huge secret and taking care of her sisters at such a young age. In their world, it is very dangerous to have any magical capabilities whatsoever, and Cate and her sisters have serious magical capabilities! They’re all witches! And Cate has to try super hard to keep this fact a secret…even from their very own father! The world that these girls live in is very disturbing and dark. It, for sure, is not a time era I would envy living in, even if I didn’t have magical capabilities. There is a little bit of a love triangle in this one but, in my opinion, there really isn’t a competition. So I’d be shocked if Jessica Spotswood played up that love triangle in the following books. This book was a lot of fun to read. If you like witches in a world of historical fiction, you’ll for sure love this book. And those of you who never finished this book, you need to pick it back up! This one has been sitting unread on my shelf far too long. It was one that I couldn't resist buying because of that gorgeous cover and because it's about witches...and then started to see iffy reviews so it never got read. But I'm glad to hear you loved it!! It makes me excited to read it again! I'll have to fit it in sometime soon. Yay! I only read your last paragraph so I wouldn't spoil myself but I'm so glad you liked this book! I do love witches and historical fiction so yay! I definitely have to pick it up. It's been on my TBR list for a while.